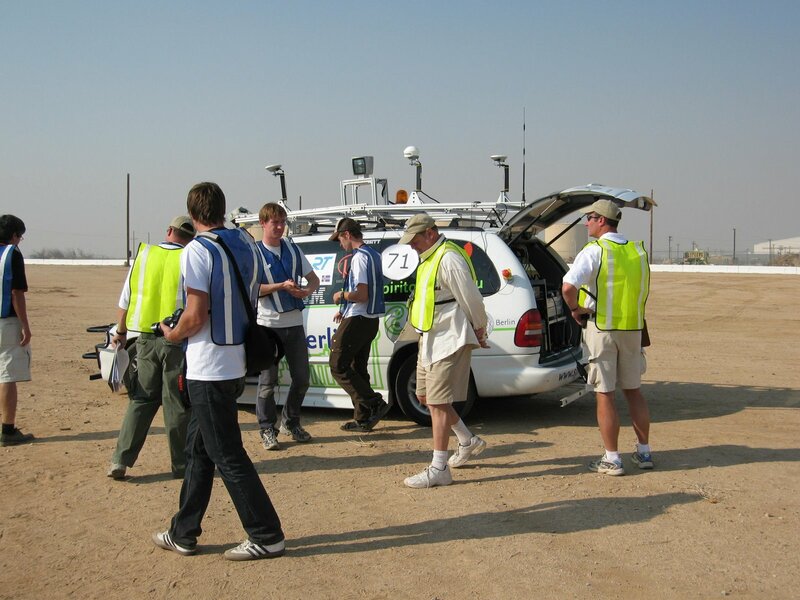 Team Berlin is a joint team of researchers and students from Freie Universität Berlin, Rice University, and the Fraunhofer Society (Institute for Intelligent Analysis and Information Systems). The team leader, Prof. Javier Rojo, is faculty member at Rice. Our second team leader, Prof. Raul Rojas, is faculty member at Freie Universität Berlin, and visiting faculty at Rice University. The rest of the team is composed of graduate and undergraduate students from FU Berlin, as well as researchers from the Fraunhofer Society in Sankt Augustin, Germany. Team Berlin was started in 2006, after a three month visit of some of our team members to Stanford University. We worked in the group of Prof. Sebastian Thrun, winner of the Grand Challenge 2005, where we had the rare privilege of witnessing the birth of Stanford’s entry to the Urban Grand Challenge. The members of the Stanford team were very helpful and gracious in providing us information and technical papers in order to start our own team. At Freie Universität Berlin we have been building autonomous robots since 1998. Over the years, we built several generations of mobile machines which took part in the annual RoboCup (robotic soccer) competitions. Our team won the World Championship in the small-size league twice, and won second place in the middle-size league once. We dominated the European competitions over several years, winning five times the European championship. In 2006, we decided to start building larger robots grounding the development in our experience with fast autonomous robots with their own computer vision. Our decision to enter DARPA’s Urban Challenge was based on a consideration of the areas in which autonomous robots could play a role in the not so distant future. By coincidence, the Berlin police department approached us at about the same time, asking us to develop a security robot for large warehouses and enclosed areas (such as airports). We proposed to develop and autonomous car and seed funding from the university was granted for the project. The system had to be lean and the total cost had to be kept under a restrictive ceiling, so that the system could be deployed in the near future. Inaccuracies of the sensors would have to be reduced using sensor fusion and statistical methods. In October of 2006, we bought a Dodge Caravan which had belonged to a handicapped person in Canada. The car had been modified so that the handicapped person could drive using a linear lever for brake and gas (the lever controls all intermediate steps between full braking and full acceleration), and a small wheel for steering the front wheels. The rest of the car’s components can be controlled through a small contact sensitive panel. EMC in Louisiana installed additional electronic, so that the car could be controlled using a computer connected to A/D converters. EMC installed also the interface for the E-Stop-Signal. The car was shipped from Houston to Berlin, where the bulk of the hardware and software development has been done, before reshipping the car back to Houston on May 18, where development at Rice University continues. As is well known, the overall problem to be solved for the Urban Challenge is to drive a car, automatically, in a city environment whose street network has been captured in a sparse graph of GPS points. Four-way crossings, static, and dynamic obstacles are present. Stop signs have to be respected, as well as precedence traffic rules. The car should be able to take an alternative route when a street is closed, doing a U-turn if necessary, and should be able to navigate and park in unstructured parking lots. It is not necessary to recognize traffic lights, the various traffic signs, nor pedestrians. These restrictions simplify the driving challenge, which, however, remains being formidable since 60 miles have to be covered under a certain time limit. Opening Ceremony of the National Qualification Event (NQE) and shaking hands with the DARPA Director Dr. Tony Tether. Welcome Meeting for the 35 Urban Challenge semi-finalist teams at the former George Air Force Base. Our Team has arrived in Victorville, CA. 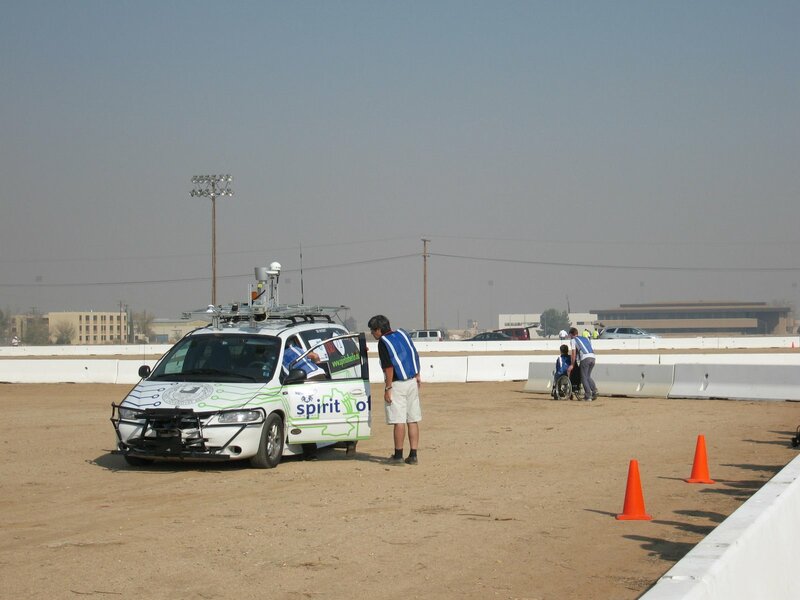 We have been driving autonomously in the campus of Southwest Research. Obstacles are now recognized by one Ibeo and one Velodyne laser scanner. Image processing is done with one video camera with a wide field of view. We added ultrasound sensors to the bumpers, to avoid hitting the curb. We are working with a new partner: Instituto Politecnico Nacional (Mexico), who is contributing a Velodyne laser for the team. The laser is installed and running. 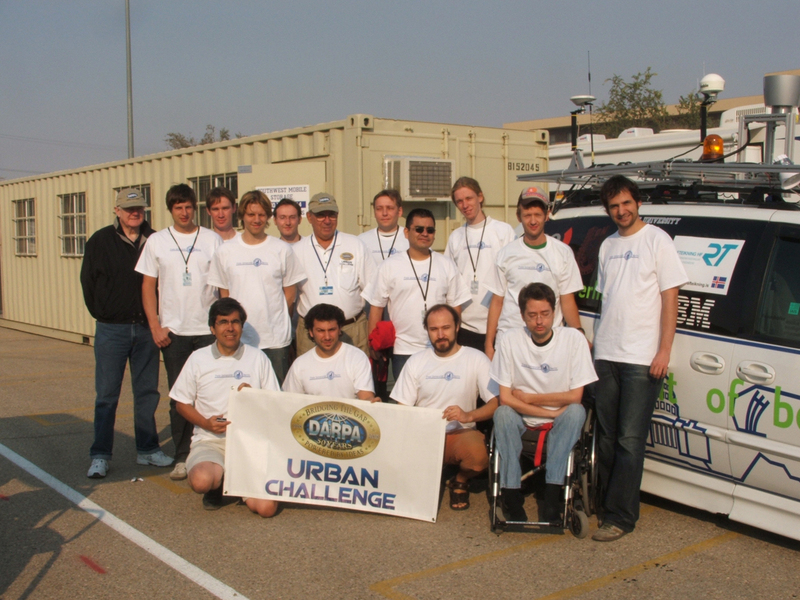 Team Berlin has been selected by DARPA as one of the 36 semifinalists for the Urban Challenge. We are going to the National Qualification Event in October! Read the press release. We are now starting to drive on the complete SwRI campus. The RNDF of the campus contains several miles of streets and challenging crossings. 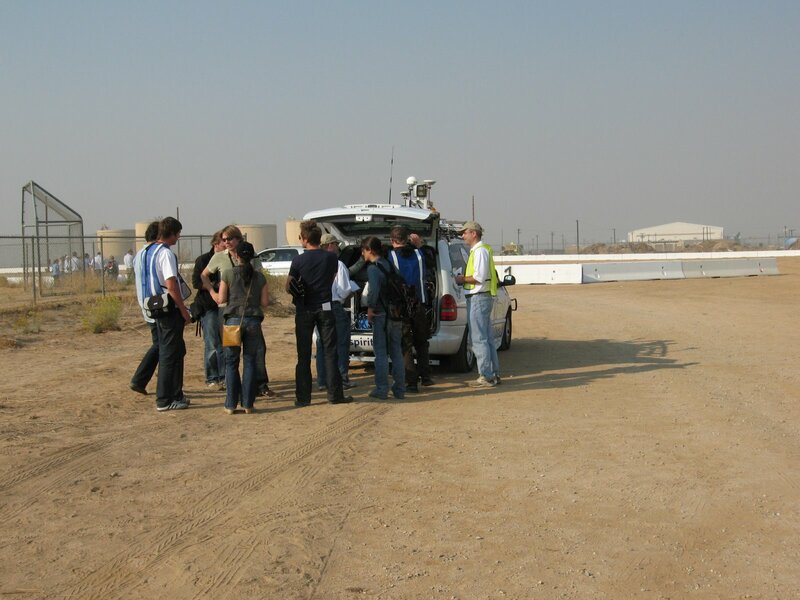 Our site visit took place on June 27. It was a successful test of our car’s capabilities. We continue testing in San Antonio. We navigate with mission data files and have the computer vision working. We submitted today our Technical Paper for the site visit, track B, to DARPA. Our car is now receiving the differential GPS signal needed at SwRI. Today, our car arrived to Houston Airport. Next stop: customs. Our car was shipped today to Houston. 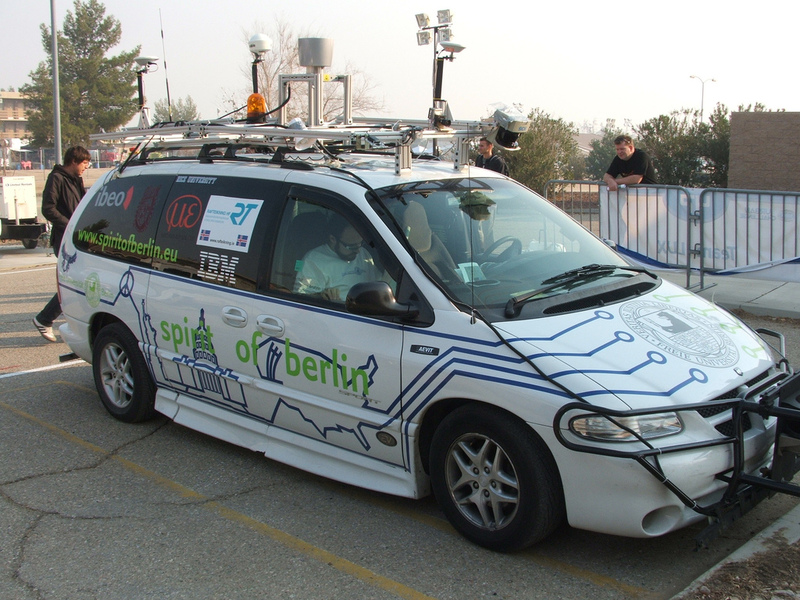 DARPA will check our car’s performance on June 26/27 in San Antonio. Check out the picture of our car taken on May 14. 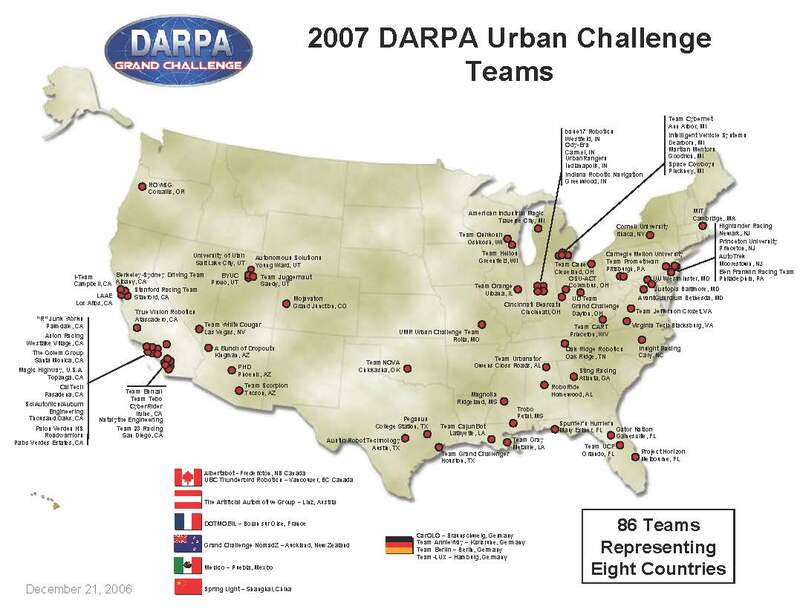 Today DARPA announced that our team is one of the 53 teams selected to take part in the next phase of the Urban Grand Challenge competition. Read DARPA’s press release. 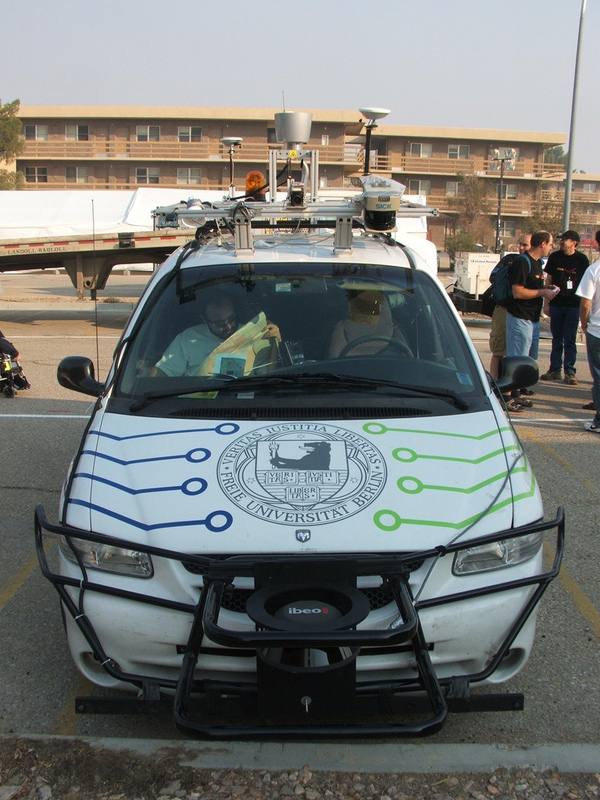 Today we uploaded our demo video to DARPA showcasing our vehicle’s technology. Next step is the site visit in June. You can see the test drive of 7.4.07 with the eyes of the path planning computer. Blinking pixels are obstacles detected by the frontal laser scanner: computer reconstructed test drive. We continue testing: Driving in good weather. The 3D-Laserscanner designed by Kai Pervoelz und Thomas Wisspeintner (Fraunhofer Gesellschaft, IAIS) is up and running. See it mounted on a car and the 3D scan captured with it. Next week it will be mounted on Spirit of Berlin. Our latest driving demo, driving around a stopped car. Fool’s day was a busy working day for us. E-Stop is working, see how we stop the car with the remote control and manually. See the car driving, keeping itself within the lane, stopping at an obstacle, and driving around it. Our omnicamera has been mounted on top of the vehicle. See our car keeping its position within the lane and avoiding an obstacle using laser scanner data. The scanner is in the front, attached to the bumper. Our car received its new skin. 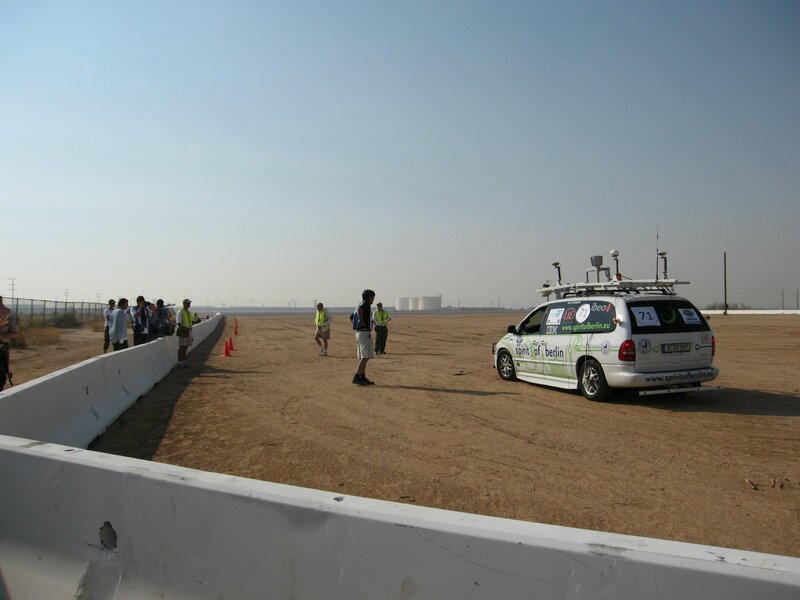 We tested successfully the detection of small static obstacles in front of the car (using a laser scanner) and controlled braking when they are on the car’s path. The car is following GPS points. We submitted today the RNDF file for the site visit at Southwest Research Institute in San Antonio, Texas. Today “Spirit of Berlin” drove with closed loop control following GPS points given by a small RNDF. Speed: 12 Km/h. Today our car drove for the first time with the steering wheel, brake and gas attached to the computer. You can see me running away from the car. We have the RNDF file for the DARPA site visit, which will be in San Antonio, Texas. 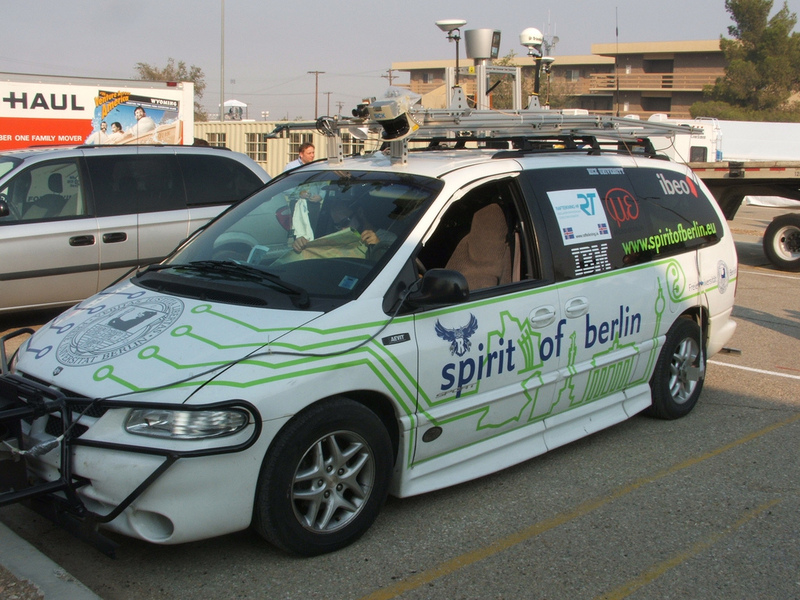 We have driving the car to collect GPS data in Berlin. Our car has a German registration now, and can be driven on the streets. Computer control works. This week the generator will be upgraded to provide enough power for four IBM Pentium dual core boards, which will substitute the laptops we have been using until now. We have now a testing area in Berlin. It used to be a “ghost town” used by the US army for training until German reunification. It is quite large and is only inhabited by some horses who have never seen an autonomous car. Try “Reaumurstr 10, Berlin, Germany” in Google maps. The testing area is clearly visible to the south of this point. Autonomous Cars Workshop at FU Berlin. Our car is projected to arrive by ship to Bremerhaven on December 29. Next step is the installation of the GPS/IMU system which has been ordered, together with two laser scanners. Our car is fully equiped with drive-by-wire technology. We can control steering, throttle, braking, parking brake, gears, all lights in the vehicle. Our car is being transported to EMC in Baton Rouge for some adaptations necessary for drive-by-wire. 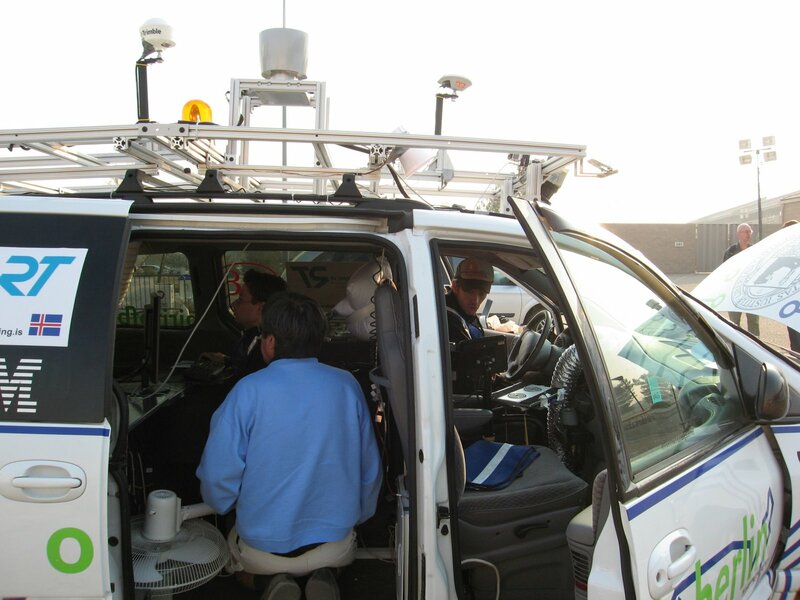 We have bought a Dodge Caravan with drive-by-wire technology from EMC. Team Berlin has been accepted as participant in the Urban Grand Challenge. Our application for participation to the Urban Grand Challenge has been submitted.